DESCRIPTION Character home on prime corner lot in Erlton, a SW inner-city neighbourhood along the Elbow River. Private, serene treed backyard has a large rear deck, firepit; & in the front a large veranda & tall, mature trees. The front entry is bright & spacious with custom built-in, oak bookshelf going upstairs to the master suite; a large space that fits a king bed, has a 3pc ensuite & view of downtown. Cozy living rm has gas fireplace & antique wall sconces (circa early 1900's) from Chateau Lake Louise renovation. Adjacent dining rm has original cove ceilings & space for a lrg table. One bdrm on this level, a 3 pc bth with a cool antique clawfoot bathtub & a galley kitchen with plenty of counterspace. Lower level is fully developed with lrg family rm, a 3rd bdrm/office, plenty of storage, 2pc bth & laundry. Original, fully refinished hardwood flrs, & some antique light fixtures provide warmth & timeless beauty to this lovely home. Location can't be beat!! 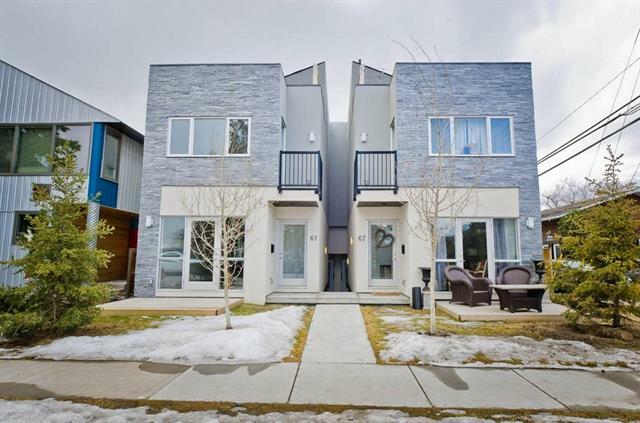 57 27 AV Sw, Calgary, Alberta, MLS® C4236948 T2S 2X7 is a Detached, 3 bedrooms, 3 bathrooms, approximately 1,039 Sq. Ft. Listing price 594,900.00. This property was built in 1929.